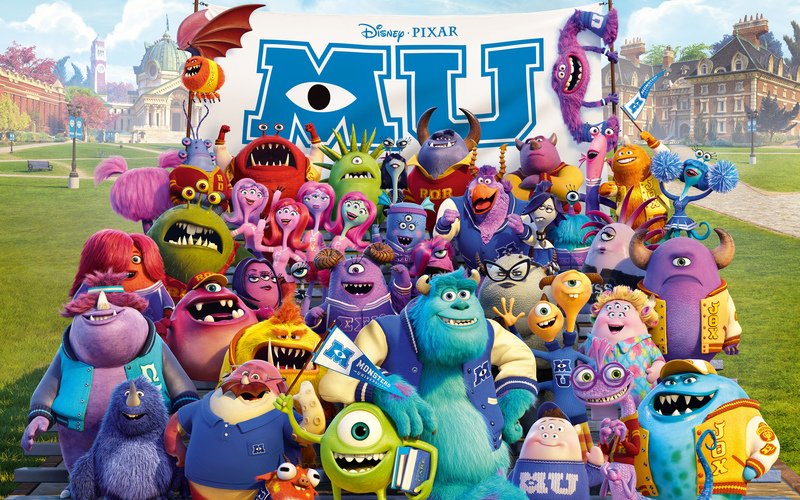 When Monsters University arrives on home video later this month (October 29), it'll come packed with all sorts of geeky behind-the-scenes features, including an assortment of deleted scenes. In addition to a series of deleted scenes surrounding a drama club subplot, we have a few alternate backstory scenes that probably would've all served as openings for the movie. Basically the filmmakers always wanted to open Monsters University with some kind of character backstory. They first toyed with telling the story of Sully (John Goodman), but everyone felt Mike (Billy Crystal) was a more sympathetic character to build a plot around. They also toyed with various ways to bring us back into the Monsters universe, like in this deleted scene where they flirted with opening the movie by showing how monsters obtain information about the kids they intend to scare. Another alternate scene that probably would've been the opening of the movie involved a flashback to elementary school where Mike and Sully meet for the first time. This came about because they wanted to honor a line from Monsters, Inc. in which Mike references the fact that they knew each other in fourth grade. According to director Dan Scanlon, this didn't work because the whole meeting each other back then and meeting again in college just sort of felt odd. Also, as you'll see in the scene below, Mike is bitter, angry and nothing much like the character he actually is in the finished film. You almost begin to despise this version of Mike, so we're glad they opted to leave this one out. We'll have a lot more with director Dan Scanlon later this month. Monsters University arrives on DVD and Blu-ray on October 29.